If I was lost on a deserted island and I could only have the books of one picture book author with me, there's a good chance I'd choose Marla Frazee. (Say what? If I was on a deserted island, I'd have more important things to worry about than picture books? Pshaw, that's what you think . . . ) She'd be in the running with several other favorite authors, so it's a decision I hope I never have to make. 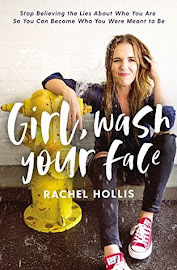 When I saw she had a new book coming out this fall, I was thrilled. Of course. 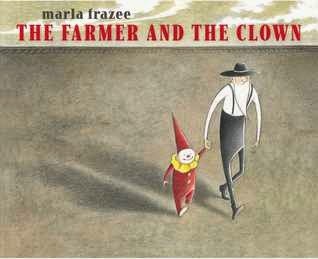 But I have to admit, at first glance, the title worried me a little; could she really pull off a book about a farmer and a clown and not have it be creepy/weird? Good news! She could, and she did. 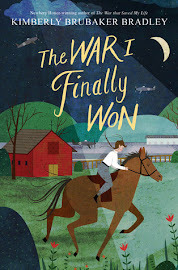 Without words, she tells the story of a lonely and grumpy old farmer (lonely, because he's all by himself in a wide, expansive field; grumpy, because he has a scowl on his face; old, because he has a long white beard). As he's going about his work, a circus train breaks the stillness. He watches it pass by and is surprised to see a little clown go tumbling off the caboose. Unaware that it's lost a passenger, the train rumbles on. So the farmer takes the little clown home and discovers a scared, sad little child under the painted-on smile. But with a little effort (and skills he didn't know he possessed), the farmer helps the little guy feel more comfortable. They spend the day sharing work and play and are just settling down for a picnic when they see the circus train chugging back along the horizon. They make a run for it and find the clown family anxiously waiting for the safe return of their littlest member. The farmer, having not known what it could be like to have someone to look out for and take care of, is sad to say good-bye to his little friend. But don't worry, there's a little surprise at the end that lets the reader know the farmer is going to be all right . . . I think it's that the plot is so unlikely that makes this book so delightful. Who would ever think to pair a little clown and a grumpy farmer together? But it works. The illustrations are up to the standard I've come to expect from Marla Frazee. They showcase her signature texture and perceptive details. One thing I love about this story in particular is the wide expanse of open prairie space where the house, the tree, the farmer, and the clown all stand out in striking contrast. My very favorite picture is the title page: the house is on the left side, the farmer is trudging off to work on the right, and in the middle is the brilliant sun rising over the horizon, its rays stretching out and linking the page together. It wasn't just me that liked this book. My kids absolutely loved it too. I didn't know if they would since we received an unbound ARC from the publisher, so it was difficult for them to look through. But I only had to read it once to them before they were requesting it again and again. They know a good book when they see one whether it's in a traditional binding or not. If you like clowns or farmers or neither or both, you'll definitely want to check out this book. P.S. If you were stuck on a deserted island, which picture books would you want for company? P.P.S. 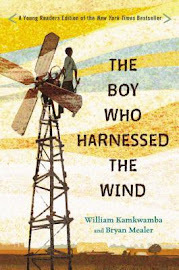 Many thanks to Simon & Schuster for the review copy. All opinions are 100% my own. I love her books, so I'm excited to check this one out, even with it's unusual cover.